I finished drafting all 98 blocks of Salinda Rupp’s 1860s sampler quilt (popularly known as the Nearly Insane), a few days ago. Today I cut out the fabric for 3 blocks. Templates and fabric for 3 blocks are ready! Isn’t that pretty? I am so excited! I have made a diary, where I am making note of the fabric requirement. I plan to cut out fabric and sew 5 blocks at a time. 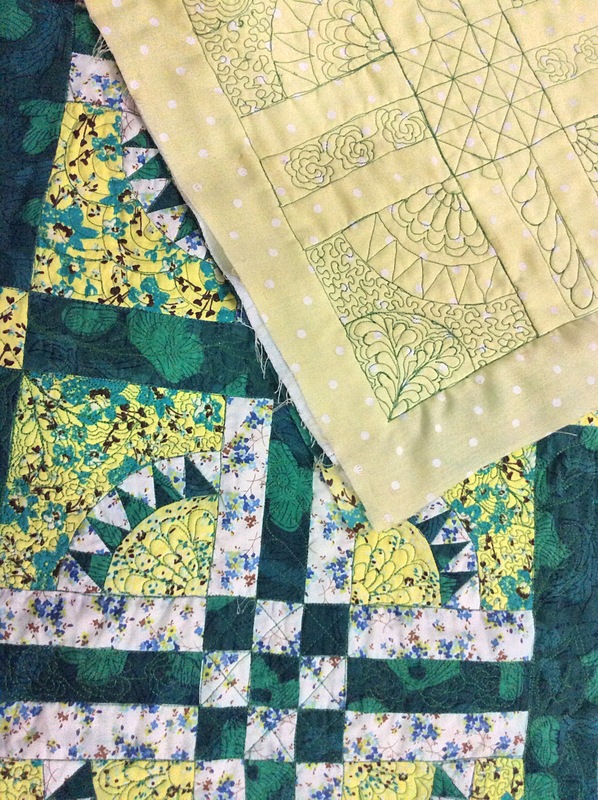 Meanwhile, I am having second thoughts about making all the blocks of this quilt. There are more than a couple which are very similar; so, first I am making only my favourite blocks. Then, I may seriously consider adding instead a few Midget and Dear Jane blocks. Those will have to be re-drafted at 6″. I will probably add a few blocks of my own too! Crazy, isn’t it? Let us see how it goes…any suggestions? This was a runner I completed exactly 4 years ago (to the date! ), my first attempt at paper piecing. I used flannel as batting and a polycotton as backing. The binding was 1″ wide, in 4 pieces – one for each side of the runner. Its edges were folded in and it was attached like a piping, one single stitch line to put it together. It wasn’t quilted either, but I was very proud of it! Over time, the pieced top shrank, the flannel shrank even more and the backing remained unmoved. 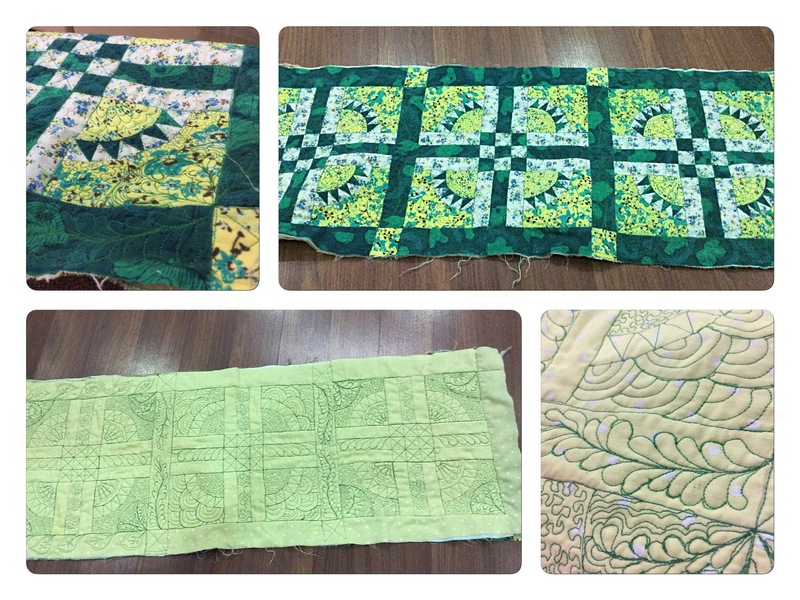 About two years ago, I took apart the 3 layers and there they lay, till yesterday when I decided to practice some ‘serious’ ( by my standards) free motion quilting on it. 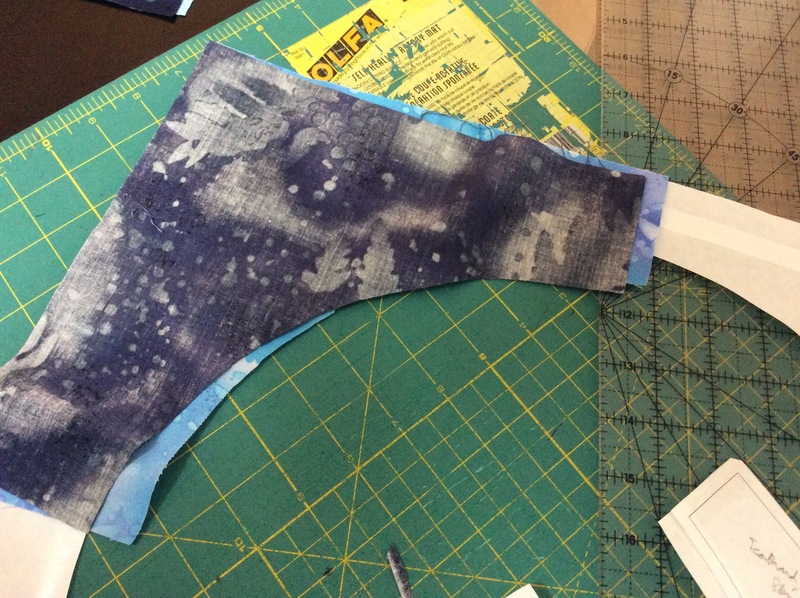 Now, the flannel batting and the backing have both moved and are about 1/2″ short! The batting and backing both fall short! Tuesday and Wednesday are my days for working on my Nearly Insane block patterns. On Thursday and Friday I work on other new projects. So I will get back to this on Saturday. Meanwhile, please admire my micro stippling and of course, my feathers. I used the ‘bump’ method to make them. 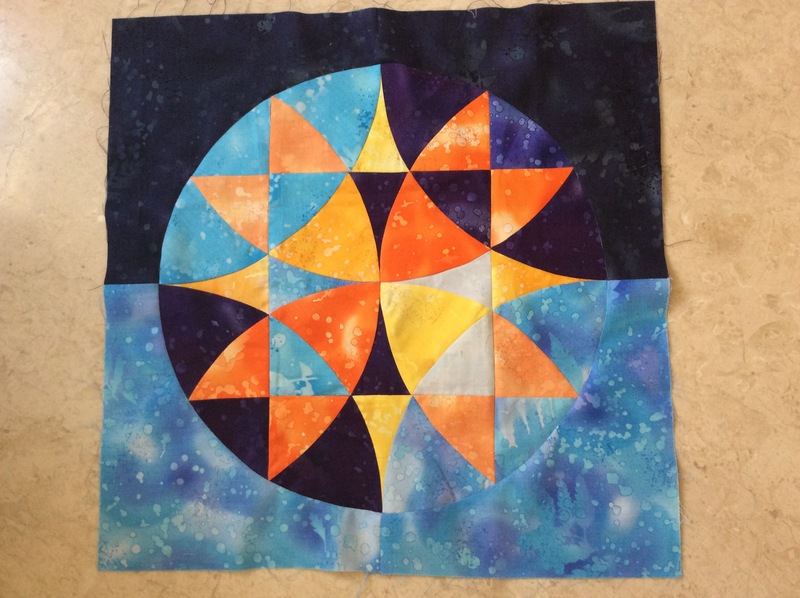 I think it was prettier without the quilting … but then, a quilter has to learn to quilt! I changed to my expensive thread midway through this and after that everything moved like a dream! I hadn’t quite believed it when I read it, but using good quality thread does make a massive difference to how your quilting looks! Not that that makes me happy. It only means my hobby becomes even more expensive. Perhaps I should start selling my patterns now…Unless people are willing to send Aurifil thread to me in exchange for my patterns? 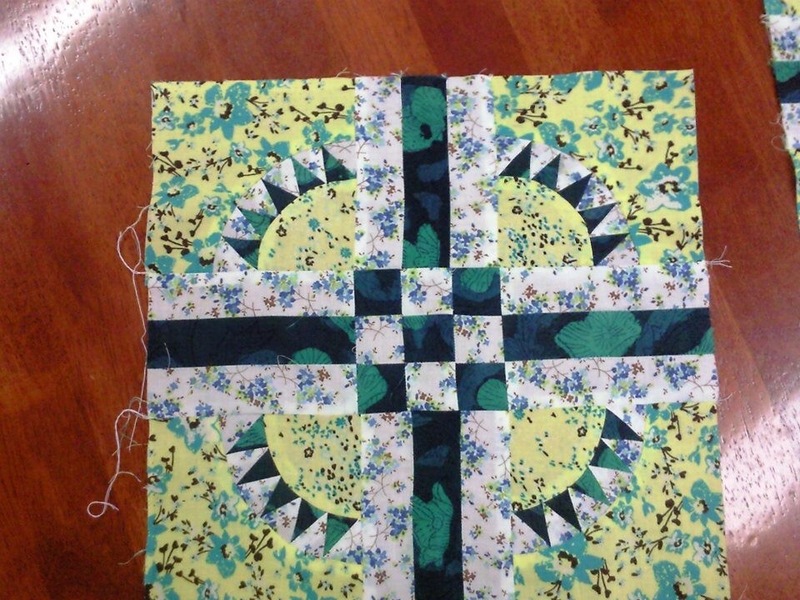 Yesterday, I drafted the first 20 blocks from the quilt on Quilt Assistant free quilt software. I have Liz Lois’s book to help me – I will be needing the computerised templates, unless I am willing to sit with tracing paper and pencil! Like I mentioned, I shall try to foundation paper piece some of it, though I have no idea how I will get the paper out from under 1/2″ HSTs ( diagonal half of a 1/2″ square for the uninitiated). Why does this quilt fascinate so many people? 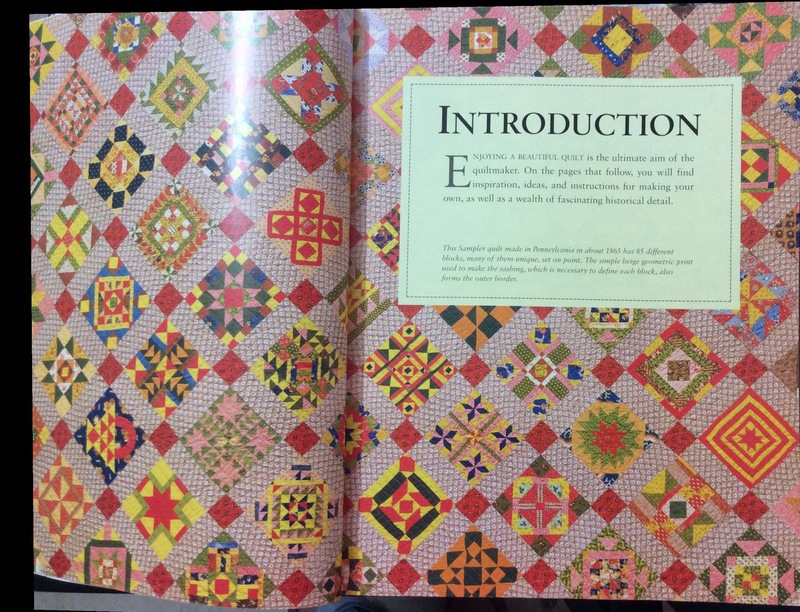 Here is picture of one of the blocks from the original quilt, taken from ‘The Ultimate Quilting Book‘. I zoomed in on the picture of the quilt in my book to get this right. Liz Lois has simplified this block some what, but I wanted to see the original. What a striking combination of fabrics and colours! I also find those missing points from her triangles utterly charming! 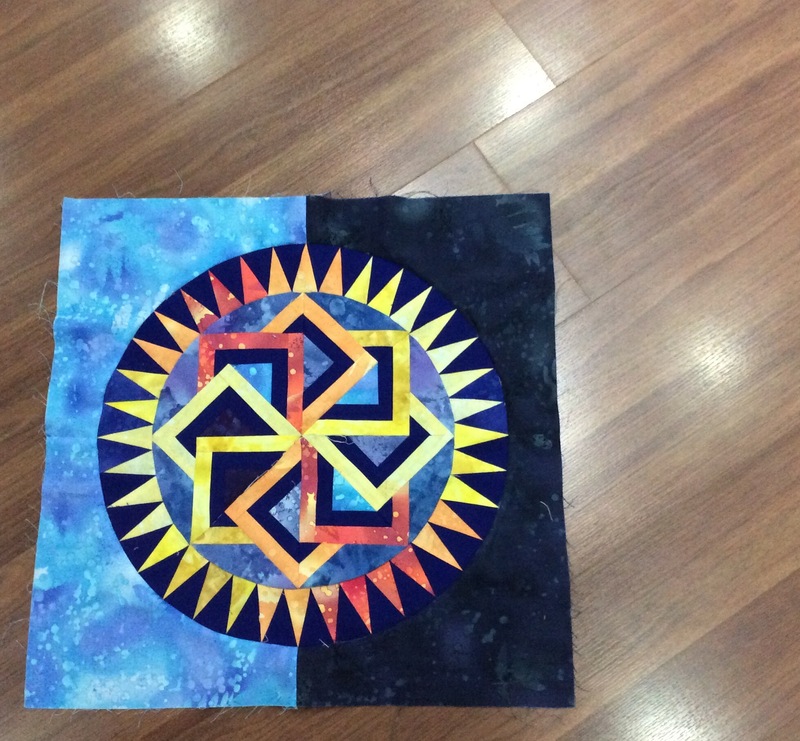 Salinda Rupp worked without rotary cutters and our rulers and came up with this magnificent sampler quilt. She nudged some of those blocks into size, I believe, trying to fit the block into the designated 6″. Magnificent Obsession: Going Insane – Nearly! I first saw this a picture of this quilt about seven years ago, and fell in love instantly. I decided to make mine in blue, yellow and green with white to offset the busy nature of the blocks. Liz Lois has not given any fabric estimate in her book, so I ordered a layer cake of Summer Breeze iii by Moda Fabrics with matching solid fat quarters. I am not very happy, because several of the prints are pretty large, so I shall probably end up doing the blocks mainly in solids, with a dash of prints here and there. 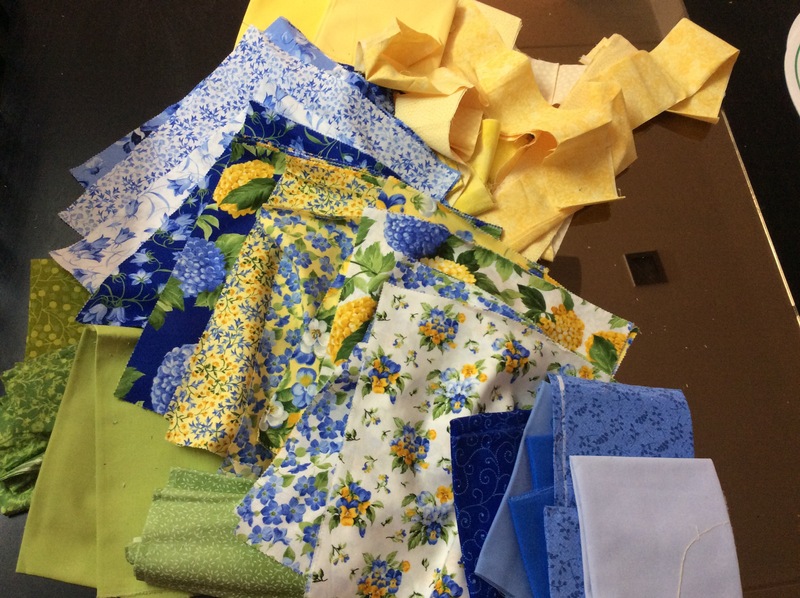 I did have a jelly roll of buttercup yellow and a couple of fat quarters of periwinkle blue which should look good here…Or perhaps, I will order a fat quarter of each of the tinier prints – there are about 4-5 of those in the Summer Breeze collection. I am drafting the blocks – which I plan to paper foundation piece to the extent that I can – on Quilt Assistant free software. The easiest blocks have just 10 pieces and the most intricate one has, hold your breath, 229 pieces! Yes, that is right, 229 pieces in a 6″ block! I will be sharing my progress as I go along. Would you like to join me? 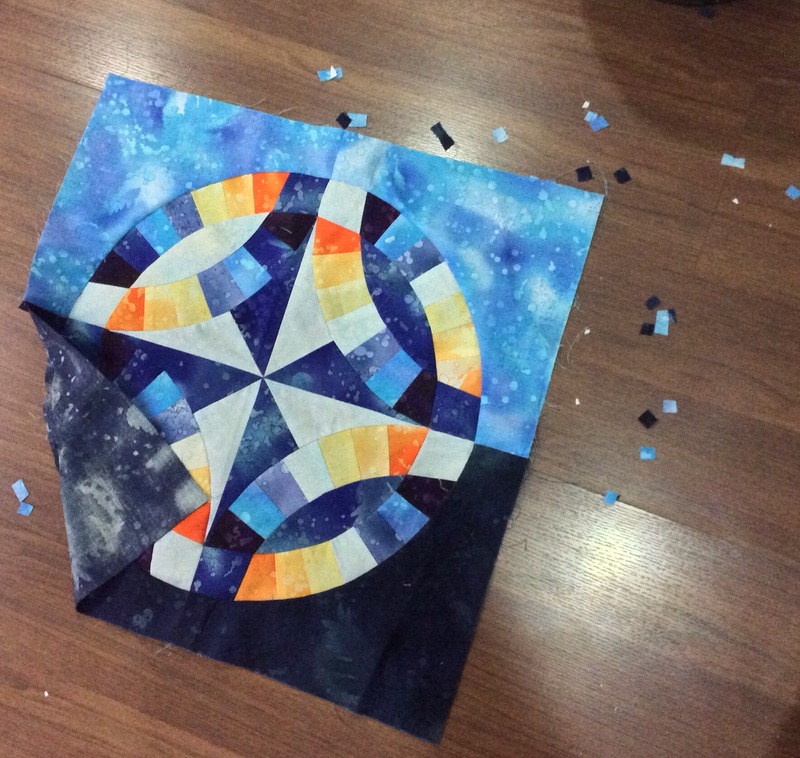 I really am not sure if I am allowed, for copyright reasons, to share the paper piecing templates I will be coming up with…I know EQ drafts are available for free download, but I do not have EQ and am in no mood to invest in it right now. 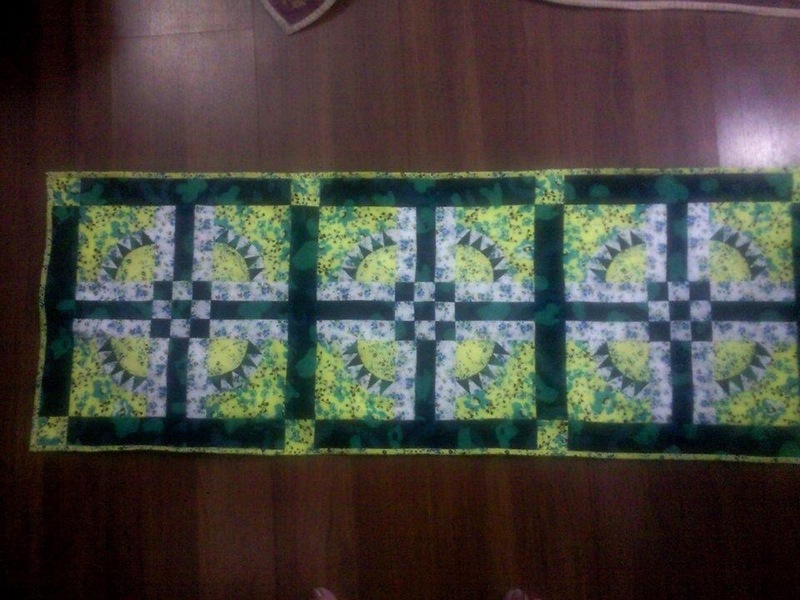 By the way, I am not sure if I like all the blocks in the quilt and I do plan to add a few of my own! 1. http://www.nearlyinsane.com – Liz Lois’s website for her book of the drafted blocks. 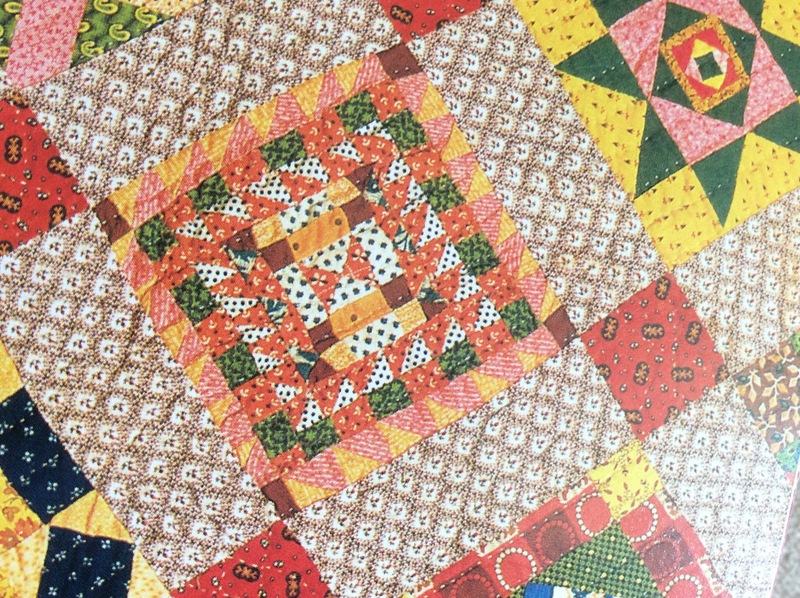 2. http://nearlyinsanefans.blogspot.in – ” This blog is for fans of the ‘Nearly Insane’ quilt created in the 1870’s by Salinda Rupp…”, says the blurb. 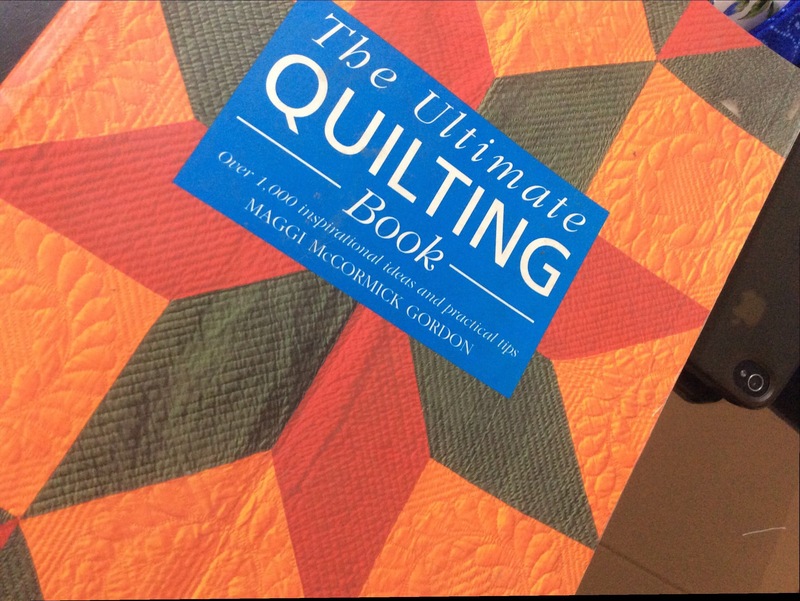 3. http://fabadashery.blogspot.co.uk – This is probably the most useful resource available to a nearly insane quilter. 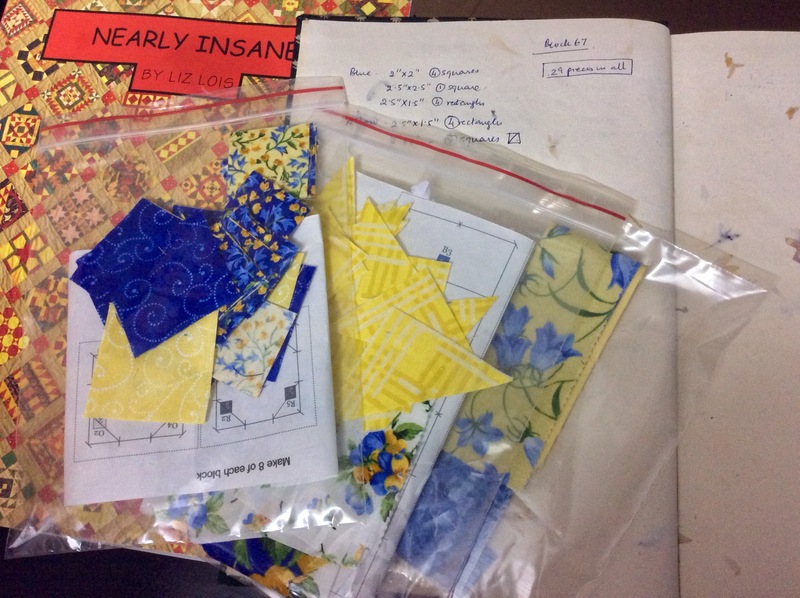 She has given, with pictures, a description of how she English paper pieced each block. 4. https://groups.yahoo.com/neo/groups/nearlyinsane/info – A yahoo group, which is not very active these days. 5. Pinterest – You can look at lots of pictures of the quilt for inspiration! Before I go off to draft the blocks for my quilt, here is a dekko at the fabric I will be using for it! Pretty, isn’t it? Author MadsPosted on October 13, 2015 Categories Nearly Insane quilt, Patchwork of my lifeTags 1870s sampler quilt, Introduction to Nearly Insane, Nearly Insane, Salinda Rupp3 Comments on Magnificent Obsession: Going Insane – Nearly! 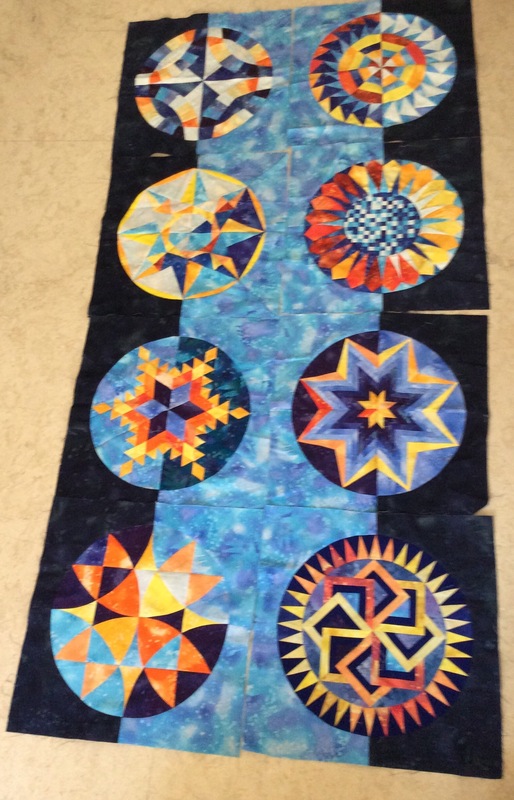 Eight of the blocks are done today. I now take a break, till I get the lighter blue fabric for the centre blocks. I modified Sobana’s porthole method to join today’s block circle to the centre. This is what I did. 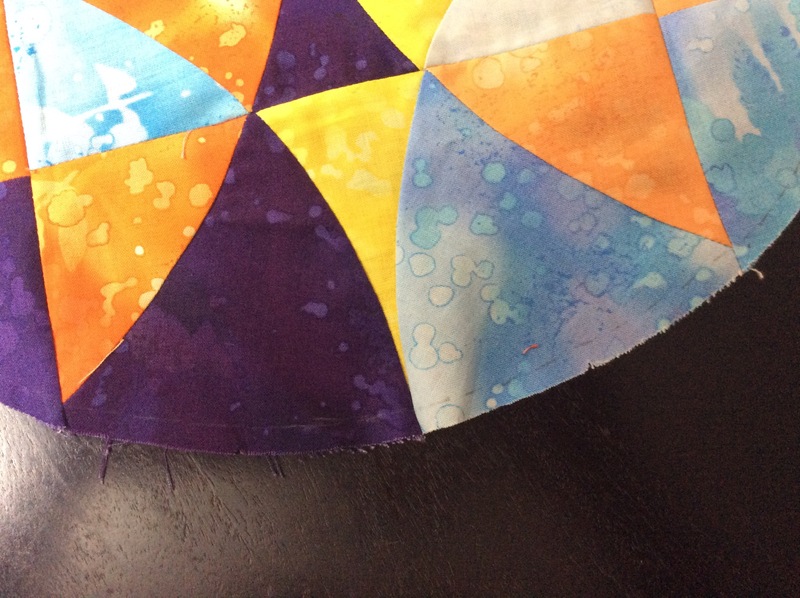 I marked the seam line 1/4″ inside the circle edge. Mark the seam line on right side of circle. I pieced the background on the freezer paper template. 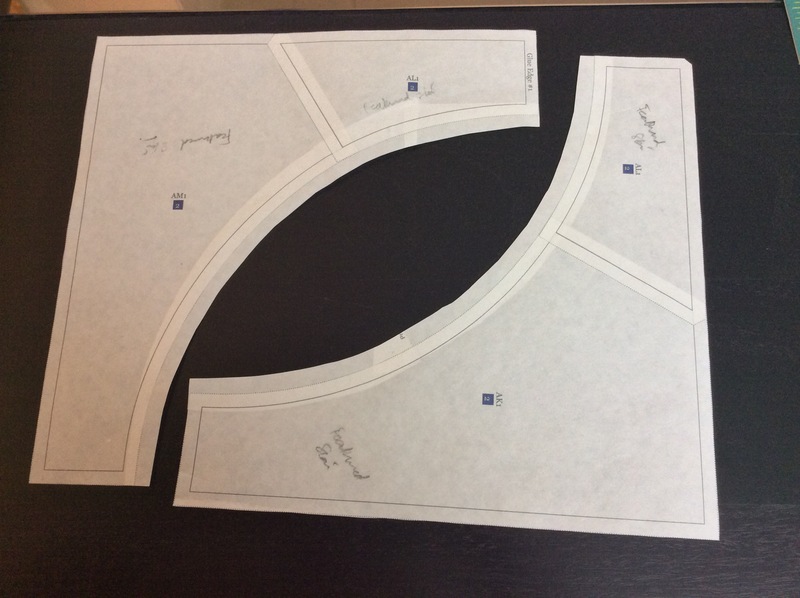 Prepare the background on the freezer paper template of 18.5″ square from which a circle of 7.5″ radius has been cut out. I now made tiny snips on the inside circular edge till about 1/8″ of the paper. I will use Sobana’s pics to show you what was done next! 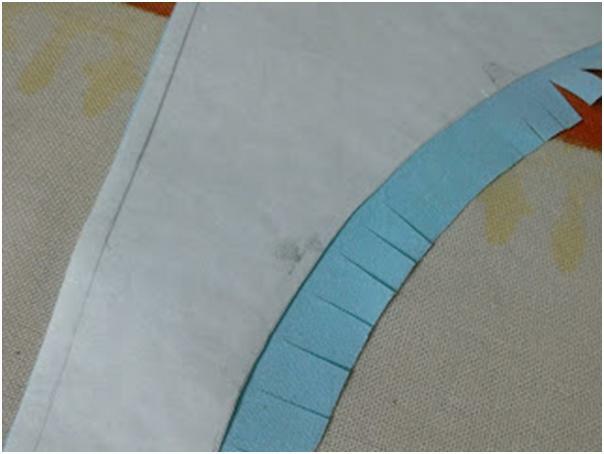 Snip the inner circular edge to within 1/8″ of the paper edge. Press the snipped edge over the paper. Fold the seam allowance back on the paper. Sobana suggests glueing it lightly on to the paper to hold it in place. I skipped this – I did not use glue. She placed both pieces right side down and glued the seam allowances together! I placed both pieces right side up, the circle below the background. I ironed the two together, but the glue from the glue stick had dried by now, so this did not work! Now I applied glue on the circle edge – I used washable liquid school glue instead of the glue stick. I pressed the background on top of it, using the seam-line marked with pencil on the right side of the circle as a guide. This eliminated the guesswork out of correct placement of the circle! I removed the freezer paper now and stitched the two pieces together using the crease line on the background as a guide, like for the other blocks. Perfectly matched points at the edge of circle! I am wondering if I should finish the chopsticks while I wait for the fabric. I am more inclined to start on a brand new project instead! Insane? Yes, Nearly Insane! I have the fabric chosen and ready for the 6″ blocks, which contain 70 to 229 pieces! Care to join me? The prettiest completed so far? I wrote a whole big blogpost explaining how I attached the Pixellated circle to the centre of thIs, the Spiked Dresden block…and then, I hit the ‘trash’ button instead of the ‘save’! The post is untraceable now. Right now, I am …like …grrrrrr! I will get back to that when I am in a better mood. Meanwhile, I do think this block is the prettiest of the seven completed so far. What do you think? Final Countdown – That is Half a Dozen Done. Two more blocks of the Round the Year quilt done today, using the porthole method described by Sobana Sundar in a previous blogpost. The first was Card Trick, Block Three, which got done quickly. The Card Trick block was not tricky at all! joined to the background using the ‘porthole ‘ method. I used the points on the triangles on the edge as a guide to glue the background to the circle. The other block that I did was Wedding Ring, which gave me a lot of trouble as I did not glue the background correctly. The resultant seam ranged from 1/8″ to 3/4″. I had to rip it and re-do it. This block gave me a lot of problems! I was not very happy with the end result. For the next block, I will do something different. I will mark the seam line on the front of the circle, and glue the background accurately from the top, using the seam line as a guide. I will take pics to clarify what I mean. Meanwhile, I had promised to show you how I stitched the background with no fabric wastage. 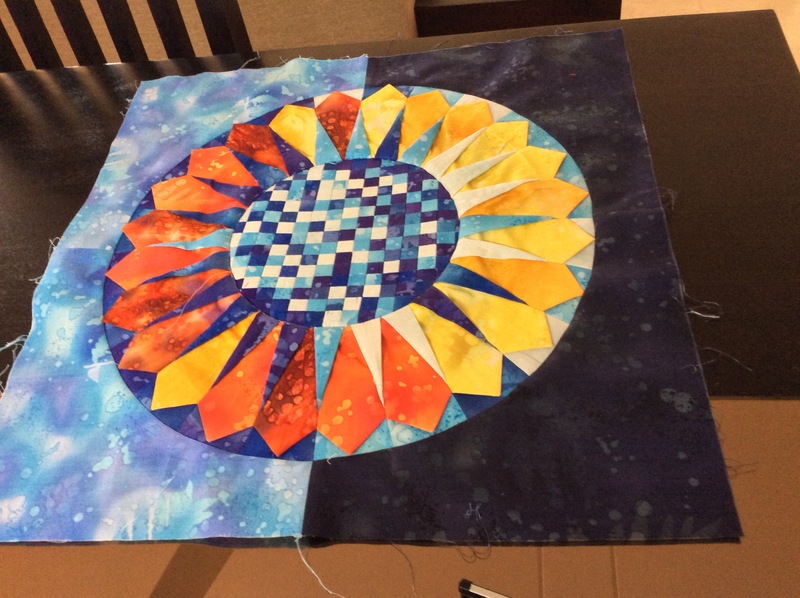 In the normal course, one would stitch together two rectangles 9.5″x 18.5″ in the two blues ( along the longer edge, and end up with an 18.5″ circle. On this one would mark a 7.5″ circle and cut about 3/4″ inside that. 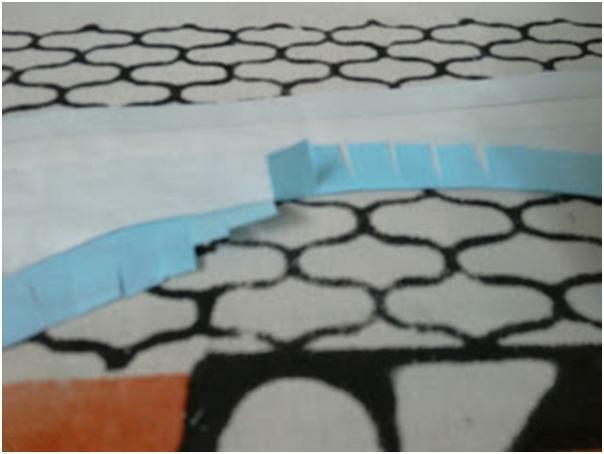 I added a circular strip on the inside edge of the freezer paper template to increase the seam allowance to about 1/2 ” . 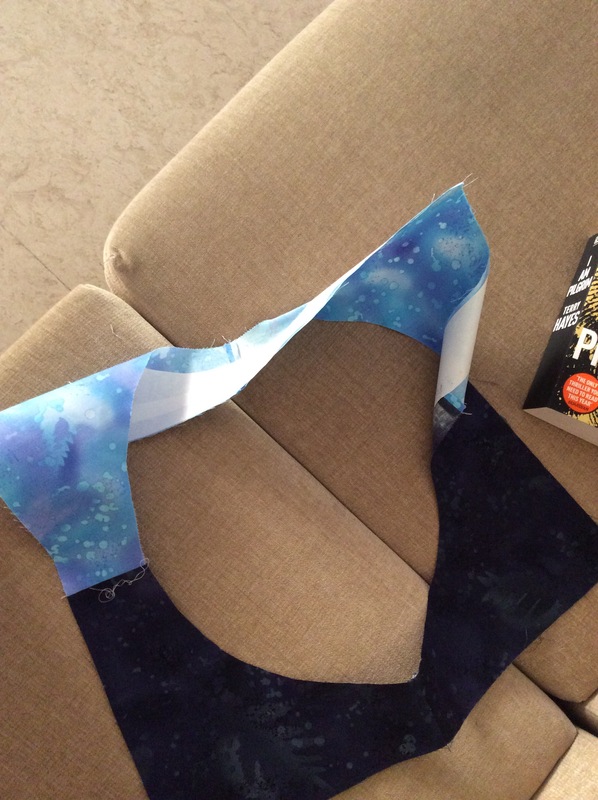 I ironed the templates on the background fabric and cut out a further 1/4″ inside. I also took an extra 1/8″ on the outer long edges. I will trim the blocks to accurate size once they are done. Remember, NOT to take and extra allowance on the small straight edge! That has to be exactly 1/4″. You need 10.5″ x 12.5″ fabric for 2 quarters as above. 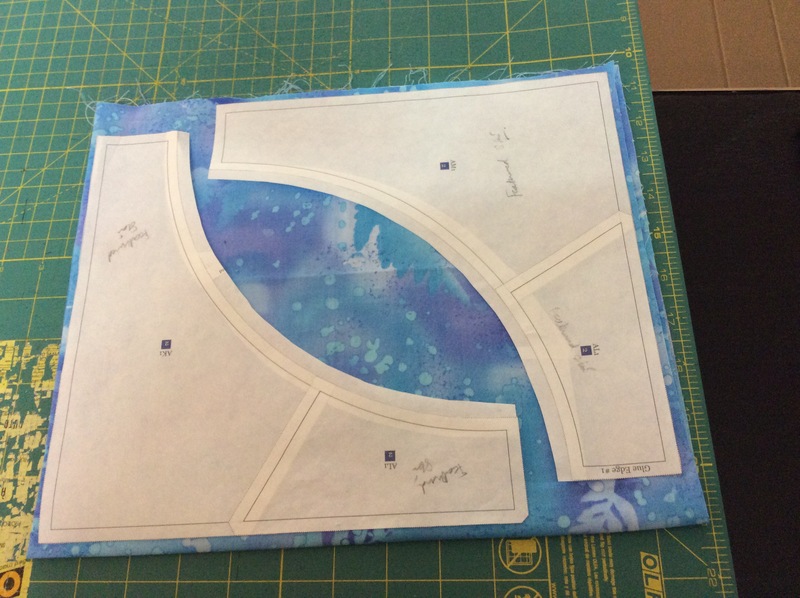 Which means that for one block you need either 10.5″ x 25″ or 21″x 12.5″, depending on how you place the templates. Piece the full backgound directly on the freezer paper. 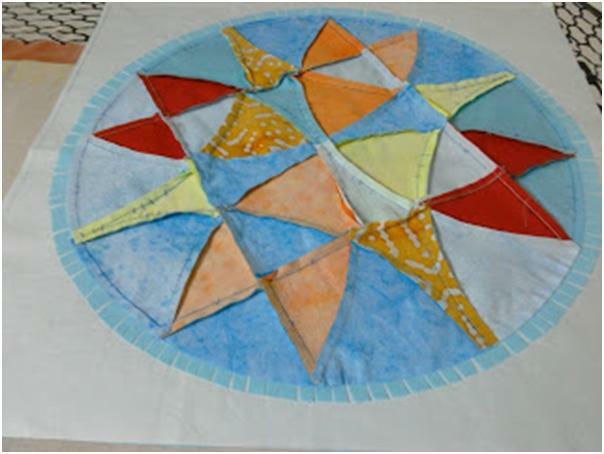 I then cut out the freezer paper template described by Sobana in her post – an 18.5″ square with a 7.5″ radius circle cut out of the centre. I pieced my background using two light blues and two darks directly on this template. If you have any questions, please feel free to seek clarifications! Author MadsPosted on October 9, 2015 April 13, 2018 Categories Free Stuff - Tutorials and Patterns, Patchwork of my life, Round the Year quiltTags Card Trick Quilt Block, Dreamcatcher Quilt, free tute, porthole method, setting circles to squares, Wedding Ring quilt blockLeave a comment on Final Countdown – That is Half a Dozen Done.